Don't blink, but the U.S. is making some short-term fiscal progress. The main reasons are good (the budget caps and sequester) and bad (the January tax increase), but in any event the final budget numbers for fiscal 2013 are instructive. The Congressional Budget Office released its annual report for the fiscal year that ended September 30 to little fanfare late last week. The Treasury Department took the only notable bow by bragging about the "continued and significant progress in reducing the deficit," which is like the contestants on "The Biggest Loser" breaking into tears of joy when they drop below 300 pounds. The 2013 deficit weighed in at $680 billion, or 4.1% of GDP, which is down from nearly $1.1 trillion and 6.8% of GDP a year earlier. As the nearby table shows, this continues the gradual decline from the Obama Administration's record deficit blowouts from 2009-2011. In five years President Obama has borrowed roughly $5.7 trillion, which is more than the entire gross federal debt as recently as the year 2000. Debt held by the public as a share of GDP has nearly doubled in those five years to 76% from 40% in 2008. The more important story is why the fiscal picture is improving, at least for the time being. The main reason is higher revenues, which rose a whopping 13.3% for the year to $2.77 trillion. 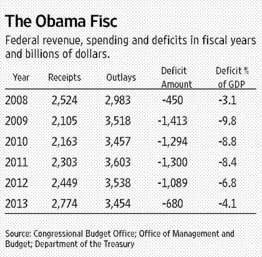 That's a new federal revenue record, surpassing the previous high of $2.57 trillion in fiscal 2007.